I'm a big fan of having plants and fresh cut flowers in the house, which is why I arrived home the other night bedraggled from the rain yet triumphantly clutching a bouquet of the most epic flowers I've ever seen. After I posted pictured to Twitter (what, isn't that what YOU do after a trip to the grocery store? ), I decided to find out how these lovely things are made. Friends, the secret to that seems to be more closely guarded than the recipe for Coca Cola. I doubt I could get an answer even if I showed up to the floral department with a camera crew and a badge saying I was from the Science Channel's "How It's Made" program. The lovely blooms I purchased are from the Netherlands and their website was sparse on details. They said they used white roses, but didn't give much away beyond that. Other sites I went to detailed everything from glasses full of food coloring and special hypodermic needles to aliens and magic. 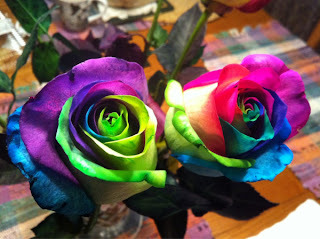 It got me wondering, why do flowers change color at all? Hi-ho science, away! While I didn't lose sleep over this question (that may or may not be a lie), it still bothered me. Inject food coloring into a human and we don't turn blue. Why does it work on flowers? A few trips to Google later, I had some truly fascinating answers. 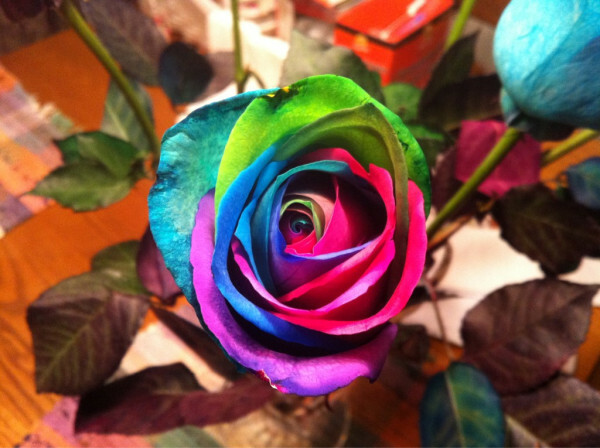 When a colored dye is introduced to water and a white flower (like a white rose or white carnation) is put in that water, a chemical reaction occurs. The flower will pull the dyed water up through the specialized tissue in it's stem and that water will form a hydrogen bond. This bond ensures that the water molecules are evenly dispersed into all parts of the plant, infusing the white petals with color. Plants and flowers "breathe" through a process called transpiration. What this means is that water evaporates from leaves and petals and new water is pulled up through the stem to replace it. Since the dye used to change the color of the petals bonds with the hydrogen, the process draws the bright colors out onto the petals and leaves to replace the evaporated water. 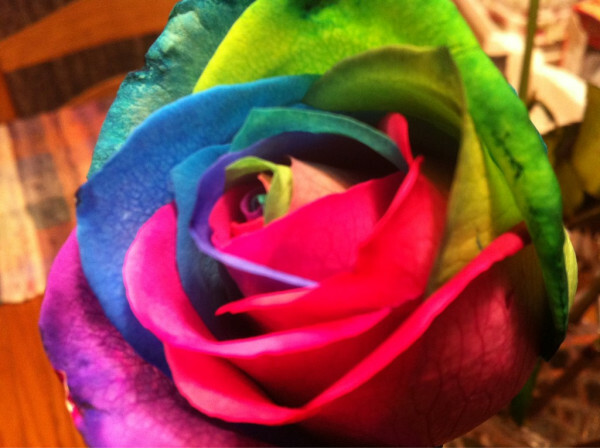 While the water can evaporate, food coloring and dyes can not, leaving the flower healthy yet brightly colored. There you have it. Thanks to how awesome flowers are and the wonders of science, we can display fantastical rainbow dyed flowers on our kitchen tables. So the next time you see a cheerful bouquet of bright green carnations or an astonishingly tie dyed cluster of roses on sale at your local market or florist, remember how these lovely flowers were made even more lovely with the help of science. Now, if you'll excuse me, I have to go spy on some Dutch rose growers. Check the stems. Chances are, there will be small punctures. Different colors were probably injected into the stem in various areas, then the plant was placed in clear water. This way the color wouldn't bleed out to the whole stem, changing the plant one color instead of multi-colored.